The varied topography and vegetation of Gujarat supports a wide range of Wildlife in Gujarat. This princely state of yore is frequented for its many forts and palaces, temples, and historical monuments. The forests of Gujarat provide ideal surviving conditions for the rich flora and fauna that exists here. Environmentalists come in these natural reserves of Gujarat with the motive to learn and graph the animal kingdom and get engrossed in the call of the wild. The Government of Gujarat is taking serious steps to safeguard its ecological balance and preserve the many wild animals that have made these forests and parks a natural habitat. Barda Wildlife Sanctuary, located15 kilometers from Porbandar, is one of the most frequented wildlife sanctuaries in Gujarat. Barda Wildlife Sanctuary is also known as Rana Barda forest, as once this area belonged to Ranavav a city in the district of Porbandar, in Gujarat. It stretches over 193 square kilometers and was declared a wildlife sanctuary in 1979. The whole area is a study in undulating terrain, flat lands, dense vegetation, rivulets and streams. The Joghri River flows through the sanctuary and acts as a natural reservoir for the animals that take shelter here. If you are visiting Barda Wildlife Sanctuary, be prepared to see a whole array of wild animals like the chinkara, sambar, spotted deer, leopard, wolf and chameleons. 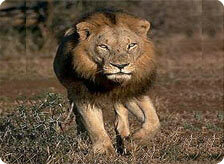 Previously it was home to the rare Asiatic lions, but they have been moved to the Gir Sanctuary. Significantly enough, Barda Wildlife Sanctuary is a disturb-free area, where the rules and regulations against poaching are severe. The avian life in Barda Wildlife Sanctuary is a delight for ornithologists and tourists. The rare spotted eagle and crested hawk eagle can be seen here. If you are lucky enough you might catch a glimpse of the migratory birds too, which can be seen crooning near the river. Hence, the sanctuary also lays claim to being one of the important bird sanctuaries in Gujarat, as well as India. The best season to visit this sanctuary is from November to March.